Precision MicroDynamics, Inc., a leading manufacturer of high performance motion control systems and components, has announced today the availability of Polaris™ to machine builders everywhere. This new system consists of a controller, amplifiers, and an ultra-fast real-time communication network for distributed motion control. Software includes general motion control, computer numerical control (CNC), machine setup, tuning, and programming tools. 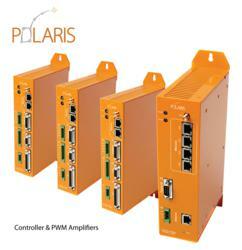 Polaris system core components include the controller, real time network and amplifiers. The controller manages all the real time motion and networking tasks. Mercury provides the real time Gbit/s communication network and the amplifiers provide feedback control and electrical power to the servo motors. A Polaris system can control 124 synchronized servo axes. Other Polaris hardware offerings include digital I/O, analog I/O and stepper motor control. The Polaris motion controller has a standard Ethernet connection to communicate with the HMI, and four Mercury ports for real time communication with the servo amplifiers. Motion programs are stored on the controller. The HMI sends commands to the Polaris controller and monitors Polaris for machine and process status. The controller provides a powerful platform for storage and execution of motion programs and GCode part programs. Path planning, machine kinematics and fast data streaming are integral to the Polaris controller. Polaris is the leader in the coordination of motion with high-speed digital processes such as machine vision and laser triggering. The path planner can generate 400,000 set-points per second. For a machine having eight high performance servo axes, the set-point rate per axis can be as high as 50 kHz. Mercury™ is the fastest, most efficient motion control network available. Some notable features include: Gbit/s data rates, guaranteed real-time delivery of information, synchronous, asynchronous and streaming data, lowest network overhead, and nanosecond network time protocol. Polaris amplifiers receive set-points from the controller via Mercury, compute feedback loops and provide power to the servo motors. The servo rate is settable up to 200 kHz. Advanced PWM switching is used for performance previously only available with linear amplifiers. Motors from 24V to 400V are supported including small, high speed Galvos to powerful linear BLDC motors. All major feedback devices are supported and a 16,384x sin/cos interpolator can be used for picometer position resolution. Each amplifier has a servo processing unit (SPU), which is an embedded microprocessor optimized for executing feedback regulators. Each SPU provides abundant processing power, making feedback filters with frequencies as high as 200 kHz possible. All unwanted machine vibrations can be virtually eliminated using high order digital filters and the extra SPU capacity can be used for real time statistics and diagnostics. High capacity data acquisition is an integral part of Polaris. For a benchmark eight axis system, concurrent control and simultaneous data acquisition can be performed at 50 kHz/axis. All set-points are sent and all actual positions, velocities, and motor currents are read back at 50 kHz for a total bandwidth exceeding 2.4Million floating point transmissions/s. Polaris software is easy to use and offers the latest development tools. A graphical setup and tuning utility, motion control library API and HMI development tools are the main components. Motion libraries are available for single and multi axis moves, GCode execution, and coordinating digital events such as laser triggers. Object oriented .NET libraries are available for HMI design. The Polaris system simulator allows developers to create complete applications without the need for real hardware. This can reduce the cost and increase the speed of software development. Precision MicroDynamics is operating since 1994 as a high performance motion control manufacturer. Our products are embedded in thousands of precision machines all over the world and they enable the highest throughput and precision.